In accordance with the stipulations of the Church’s Code of Canon Law, Msgr. William F. Stumpf was elected archdiocesan administrator on Jan. 9 at the Archbishop Edward T. O’Meara Catholic Center in Indianapolis. He was elected by the seven archdiocesan priests who serve on the archdiocesan college of consultors. As archdiocesan administrator, Msgr. Stumpf will oversee the day-to-day business of the Archdiocese of Indianapolis until Pope Francis appoints a new shepherd for the Church in central and southern Indiana. After he was elected and accepted the election, Msgr. Stumpf made a profession of faith while placing his right hand on a Bible. In leading the archdiocese through this time of transition, Msgr. Stumpf’s authority will be limited by canon law. He is prohibited, for example, from closing parishes or opening new ones. He also cannot name pastors of parishes until the archdiocese has been without an archbishop for one year. Msgr. 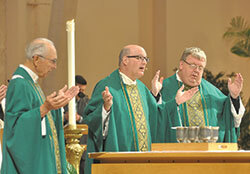 Stumpf is, however, able to name priests as parish administrators in the interim. Msgr. Stumpf will also need the approval of the college of consultors to call a man to be ordained a priest or deacon. Msgr. Stumpf said that the fact that Pope Francis did not name an administrator for the archdiocese at the time that he appointed Cardinal Tobin to lead the Archdiocese of Newark, N.J., represented a “vote of confidence” by the Vatican about the Church in central and southern Indiana. This assessment, facilitated by a private consulting group, will involve discussions with clergy and lay leaders across the archdiocese, and is expected to be concluded by June. Msgr. 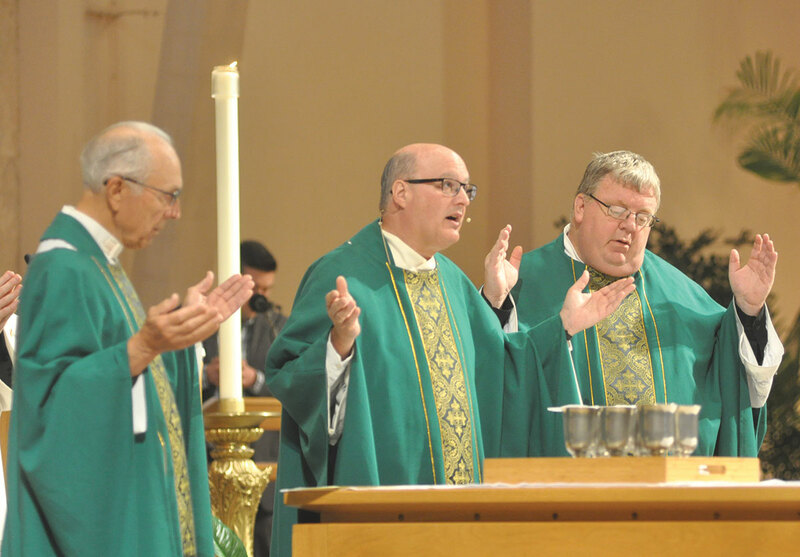 Stumpf encouraged all the faithful across central and southern Indiana to pray during this time of transition until a new archbishop is appointed.